Air Marshal MSG Menon VSM was commissioned in Administrative branch of IAF in Dec 1982. He holds a Bachelor of Science degree from Calicut University. He has undergone Higher Air Command Course from College of Air Warfare. He is an alumnus of Defence Service Staff College Wellington and the prestigious National Defence College. The Air Marshal is a Cat 'AYE' Air Traffic Controller and has commanded an operational radar unit at a major flying station. He was a member of the first UN Mission to Sudan. He has tenated the appointments of Chief Administration Officer at AF Station Jalahalli, Director National Defence University. 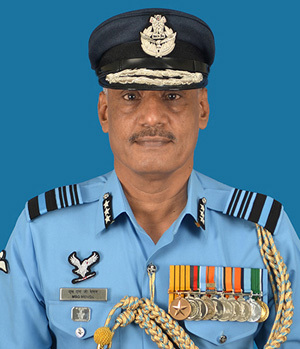 He has served as the Commandant of the prestigious Air Force Administrative College, Coimbatore and Principal Director Ops (Air Traffic Services). On promotion to Air Vice Marshal, he was appointed as Assistance Chief of Air Staff (Org & Ceremonial). For his distinguished service, the Air Marshal was commended by the VCAS in the year 2007. He was awarded Vishisht Seva Medal (VSM) by the Hon'ble President of India in the year 2016. Prior to taking over as Director General (Wks & Cer), he was the Assistance Chief of Air Staff (AF Wks) at Air HQ. He is married to Mrs. Lakshmi Menon and they are blessed with a daughter who is married and settled.